Habits are running my life. They tell me when and what to eat. They tell me when and how to exercise. I have no say. I try and fight them but I can’t. I am powerless. I don’t set an alarm clock. I’m always up before 4:30 am, sometimes earlier, much earlier. First thing I do is drag myself to the coffee maker. I do it first thing EVERY morning. No thinking, no objections. I then catch up on emails and plan for the day. I’ve recently added writing for 30 minutes. When I’m done using my mind, I’ll start my movement practice and then take the dogs out. All before having breakfast. I do this every morning, weekday or weekend, it doesn’t matter. It’s what my habits tell me to do so I do it and I don’t mind, not at all. Habits are powerful and have forged my morning routine into one that starts my day off on the right track. Habits can help you too. They can put everything on automatic. I head to work every morning knowing that I’ve already accomplished a big part of my daily goals. I also know that in the long run, I’ll make significant progress in both my writing and movement skills. And if I can do it, I know you can too. 1. Your brain loves habits. Habits run the mundane everyday tasks for us. Habits take over the menial tasks that we repeatedly do so our brains can focus on more important tasks or problems. It will allow you to dedicate your time and energy into solving problems or creating ideas. As you know, fitness isn’t a one time thing. Like any pursuit, it has to be practiced every day and it only works when you’re consistent. Your habits allow you to keep moving forward with or with out motivation. If you can create a healthy habit of exercise even when you’re not feeling up to it, it will do wonders for your consistency, and consistency does wonders for your goals. 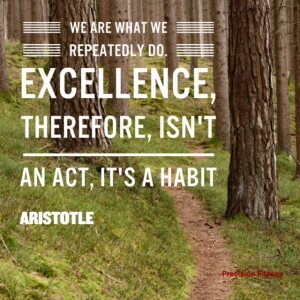 When you create a habit you reap the rewards forever. Just put in the hard work upfront and you’ll see a lifetime of benefit. I know it’s not easy; building habits or even replacing bad ones takes time and being patient can a be a big challenge. It is however so worth it. Because the other option is to get rapid results using extreme measures. You can’t keep up with the unrealistic demands so you drop out and go back to what you were doing before. And now you’re back to square one. You can avoid all of this and instead, work on the process of building healthy habits so the results you do get, you get to enjoy and keep, forever. This is why I let healthy habits run my life. It frees my mind to focus on more complex tasks, it keeps me consistent and that consistency pays off big time. It may take time and a lot of effort up front but once you create a habit, you get results for the long term. Isn’t that what you really want anyway?